Happy Monday! It's been a little bit since I've been on the blog, but I promise I'm here for good now! Moving has been a teensy (okay, a lot) more stressful than I believed it would be so I went on an unexpected hiatus both here and on Instagram. But here's to being back, I've missed blogging! Since it's almost summer I thought I would share some of the items that I've been obsessed with. Some of these are already on their way to me and others are simply just for the possible future. Along with that I wanted to update you all on what I've been up to! As you know I made the move from Orange County to Seattle, and it's been CRAZY. We drove up with my cat Henry and my roommate's dog Khaleesi (yeah, all in one car...) and have been settling in for just under two weeks now. The first few days were the most tiring and draining. I was sleeping on an air mattress with just a carry on full of items, mostly for Henry. Then everything was delivered at once and it was time to unpack. Even though I knew how long it took to pack everything up, in my head I somehow believed it would only take a few days to unpack and organize it all. HA! I'm still not done unpacking boxes and I have no clue where half of my things are. If someone ever tries to convince you that moving and unpacking are easy tasks, definitely don't believe them! It seems that no matter how far I get in the process there's always another box that I missed or another piece of furniture to be built. I'll be sharing room reveals throughout the apartment soon, but first I have to get it all together! If you want a little sneak peak though I'm constantly sharing little snippets on my Instagram stories. I really can't wait to share the decor with you all though, it's been so fun seeing my (and my best friend's) vision come to life with everything. We have definitely hit a few snags along the way, but those will be shared in later posts. :) For right now I'm just enjoying Seattle, at least what I've been able to see of it between trips to Home Goods and various Furniture Stores! Now onto a few of my favorite summer wardrobe items. I'm most excited for these blush studded sandals and this gray tie front dress. Both are on sale right now, so naturally I had to add them to my cart. Although the dress is technically knit, Seattle has been having an average temperature of 72 so I think this would be perfect for the cooler days here. Plus that tie detail is so cute, I can't wait to pair it with any of the shoe options above. I've owned the Converse slip on sneakers for the longest time, and they are super comfortable. I only put it as a wishlist item because I've worn my last pair out with use! Their the perfect sneakers to wear if you're always on the go but want to look the slightest bit more put together. 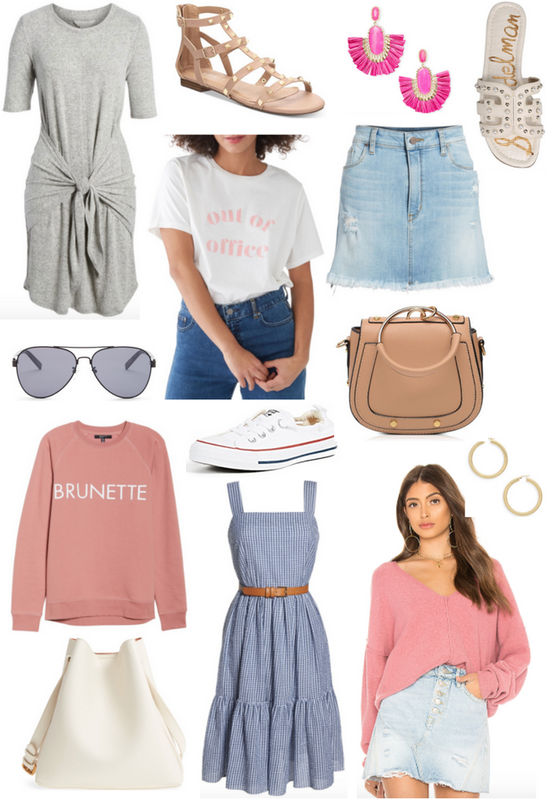 As per usual I'm drawn to pink items, and I've been seeing this brunette sweatshirt everywhere! Although the crewneck is sold out, I might just go ahead and pick up the hoodie version. It would be a great jacket to wear if you're going casual, but I think I would use it most when I go to the airport. I'm always so cold on airplanes, is anyone else the same way? Another thing that I've been seeing everywhere? Denim skirts! It's so 90's, but hey, that fashion is coming back full force! I was trying on some of these skirts the other day, but nothing had that simple style that I was looking for. When I was browsing online I found this one and it's exactly what I've been looking for. Just a simple slightly distressed light wash denim, perfect to go with all the bright shades of summer! What's happening in your life lately? Are there any summer trends that are catching your eye? getting a few of these now! love love all the items you found! Yesssssssss love all of these.....especially that Brunette Sweater and those sam edelman sandals! I love all your picks! I love the blush studded sandals..but do I need another pair of sandals!! Decisions decisions! That pink sweater looks so cozy and is the perfect flattering shade of pink! I want it :) Hope you enjoy living in Seattle and that you'll post lots of pics of the area. I've always wanted to visit! We will be moving soon and I am not looking forward to packing, but I can't wait to be settled into our new home! I absolutely dread moving. Thankfully I haven't moved in over 5 years. It is so exhausting! I love that dress!! I just recently purchased one similar to that one and it is so comfy. I had been eyeing those earrings from KS but decided on some different ones and a necklace. Great picks girl! Good luck with getting settled in from your move. I love these, especially that denim skirt and the seersucker dress. I need to do some shopping! Thanks for sharing these, Sami! Cute picks! Love both the dresses! I'm more of a Keds kind of girl because somehow my feet just aren't built for comfortable Converse-wearing. But I love these slip-on Converse! I really want to try a pair on just to compare. Good luck in your unpacking endeavors! The first apartment that my husband and I lived in actually never got fully unpacked, so I know how it feels never-ending sometimes! I'm loving the blush pink sweatshirt! I want it! So cute! great picks! I am loving these dresses! Those aviators are too cute! I just got a pair, but I'm thinking I need another one haha. I love those style of earrings but unfortunately i cant wear cool accessories like that because the second i put them on, my ears get infected haha. these are great choices! I am seriously obsessed with the brunette sweatshirt!! I love it all. Especially the out of office tee and the tote. Loving all of your picks, girl! That gingham dress is so perfect for summer. And man, if sounds like you've got a lot going on. Hope you're loving your new place! They dress looks so comfy & I need to add a denim skirt to my wardrobe. I have that brunette sweatshirt but it says "blonde"!! I wear it every week. It's SO comfortable. I am obsessed with those studded sandals. How cute! Congratulations on the move and good luck settling in! I know how stressful and tiring moving can be. I need that gray tie dress, the brunette sweatshirt, shoulder bag, and of couse the out of office tee! Can't wait to see more of your apartment! Love all of your summer picks here - those sunglasses are great!